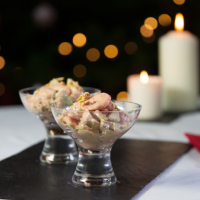 Discover Heston's take on this simple but classic dish - the perfect starter for Christmas lunch. 1 To make the Marie Rose sauce, combine the tomato ketchup, mayonnaise, cayenne pepper, Worcestershire sauce and lemon juice in a bowl. 2 Add the vanilla seeds, season with salt and pepper then mix thoroughly. 3 Combine the lettuce, tomatoes, avocado, jumbo king prawns and 45g of the Marie Rose sauce. 4 Divide between two glass serving dishes to serve.